Yaaaah-haaaaw. Sorry, I had to yawn. Hope my yawn didn’t make you yawn, too. Just don’t think about yawning and you’ll be fine. I’m just kind of bored. My inbox is still crammed up with e-mails about Sunny Acres and I’m running out of stuff to say in response—so I won’t. Sorry, I put myself to sleep just thinking about the meetings. I can’t imagine they’ll be particularly interesting. In fact, I’m betting that anyone who does feel compelled to metaphorically flog themselves and attend one of the meetings will need a healthy dose of caffeine and crank just to make it through the first half. I was so bored the other day that I gave in and made myself a Facebook page. It took the better part of four hours to do so, and I still can’t seem to get the damn thing to stop flashing 12:00, but there it is for all of you to ignore. I think you can find it through the “SLO New Times” page, or by searching “The Shredder”—or so the interns I forced to help me have explained. Now, as I try to wave off my drowsiness, let me tell you what the reporters here tell me is important about a new SLO city survey. Please, bear with me here and I promise it won’t make you … yaaaa … damnit! OK, it might be boring, but read along anyway. Just cup your hand over your mouth to be polite. This $25,000 survey says that everyone in SLO proper is happy. We’re talking severely sedated happy here. About 97 percent of SLO-idians (???) whole-heartedly approve of how the city is being run. Eat your heart out Pleasantville. Deemed a “citizen satisfaction survey,” the city’s consultant Fairbank, Maslin, Maullin, Metz, and Associates, found that everyone is pleased as punch to live here. That is, of the 400 people they surveyed out of about 45,000 residents, most were totally sa-tis-fied. Aww, yeah. Then again, they found that 41 percent of people have no freaking clue what Measure Y is. And the consultant goes on to say that they think it has a good chance of winning a second vote with something like 64 percent of voters. Basically, the city desperately needs to pass another sales tax increase because they’ve blown all that money from the last sales tax increase on whacky doodads and gizmos. So for now, the city types just need to be told by some survey results that everything’s OK and they’ve done the right thing. Way to go, guys. I’m sure everyone will be thrilled to dump more money into new trash cans, newspaper racks, and salary increases. And speaking of denying that something’s wrong. Dan Blackburn, a CalCoastNews.com and New Times alum, just published the first video on his shiny new website, KCCN.tv. His debut video focuses on a yokel in rural North County who was shooting at targets on his property. Someone called the Sheriff’s Department, who promptly arrested him with guns drawn, raided his house without a warrant, opened his gun safe, and then crafted a bunch of bogus charges to justify their raid. It’s a decent enough story, but what really shocked me was the press release sheriff candidate Joe Cortez sent in response—aside from his whole shpiel about how he wouldn’t allow this to happen if elected. Holy crap, Joe! Did you really just suggest that sheriff’s deputies need constant supervision to keep them from breaking the law? I think you did. What’s troubling isn’t that there wasn’t a supervisor, but that the deputies so flagrantly disregarded the rules and then just made stuff up and arrested a poor schlub who was firing at a homemade target. What’s really troubling is that you seem to be saying the patrol supervisors are the only “keepers of the standards,” and essentially the only ones who know the rules. Screw this. I’m going back to bed. 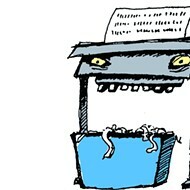 The Shredder can be “zzzz” reached at “zzzz” shredder@newtimesslo.com.